Mary A. Johnson bought this section in 1896, and opened the store in 1897. It included the Post Office until 1923 and had the only phone in Plimmerton for some years. This building was used as a General Store for more than 70 years, followed by a variety of shops and businesses. 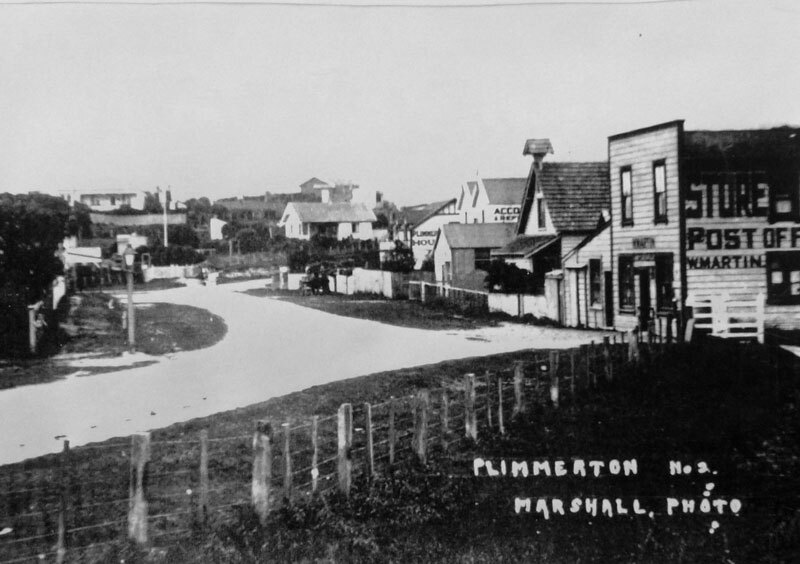 The first general store in Plimmerton was run and owned by Mary A. Johnson. The Post office, which had been operating from Plimmerton House ( burnt down 1906) was run from this location when the stored opened. In 1908 when Storekeeper Mr Robinson was post master, there were about 100 permanent residences and the Post Office opened a savings bank section. A few others covered on a short term basis from May 1918 to Dec 1918 when William Martin returned as storekeeper until 1923. William ( Bill ) and Simon Martin were originally from the Hunterville area. Bill Martin lived upstairs and Simon with his family in the little house on the side. The only telephone in the early 1920’s was in the Martins Store, next to the current Railway Station access. Other storekeepers on record were Ian McGavin for many years then Jim Milne. Johnny and Noelene Raitt operated the business as a General Store from 1958 to 1962 and then briefly three years later prior to selling the building. The Store was set up for self service shopping and sold a wide range of items. The old house next door was used as a bulk store area for such varied items as wheat and nails. There was a petrol pump outside and the store offered a home delivery service. The Raitt family lived upstairs. Other more recent business were the Devereaus cake shop, Mana Mowers and Cycles ( in 1985). Graeme and Beth Browne had the Miracles hair salon with a flat on top. Then the site operated as a Leaders Real Estate office and now operates as Black Rose Florist and Plimmerton Deli.